Geolocation application Foursquare has released version 3.3 of their iOS app and this includes some big new features, mainly integration with deal-a-day websites LivingSocial and GiltCity. LivingSocial has deals for the Australian market, whereas GiltCity is only servicing the US at the moment – however international expansion is probably high on their list. Another handy feature is a notifications tab at the very top of the application which shows info like friend requests, checkin notifications etc. I wonder about the financial arrangement paid by LivngSocial and GiltCity to be to be integrated into the Foursquare platform. 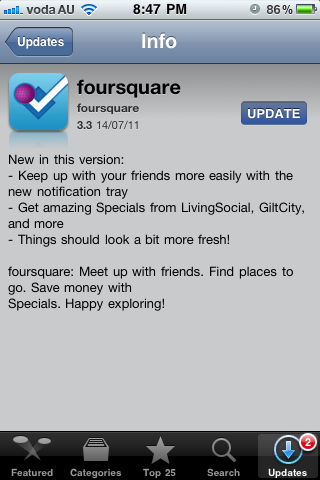 Foursquare has been working hard over the past year to monetise their product.